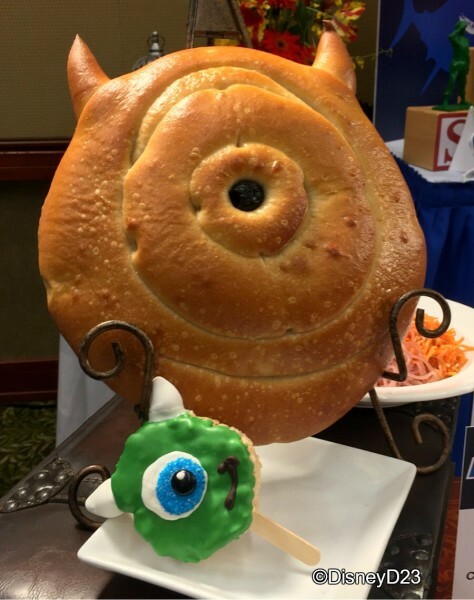 Disney California Adventure Pixar Fest Food! 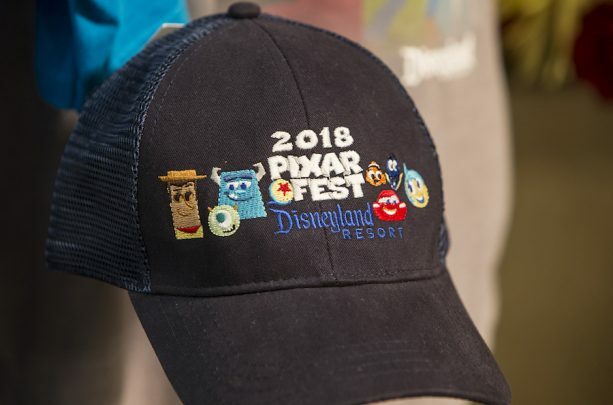 Visitors to Disney California Adventure Park are going to have a ball from April 13 to September 3 when Pixar Fest takes over the park! 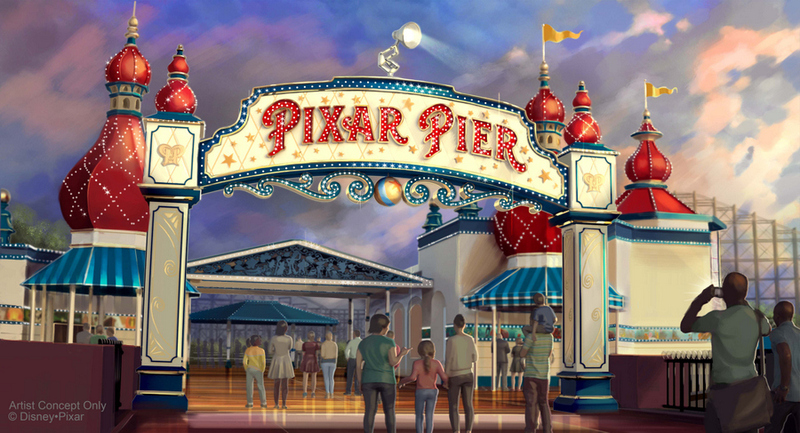 This celebration will highlight beloved Pixar films in the run-up and aftermath of Pixar Pier’s expected June 23 grand opening! Pixar Fest will introduce a brand new nighttime spectacular and re-introduce not one but two parades! 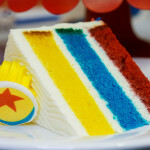 There will also be Pixar meet-and-greets, Pixar film merchandise, and fun themed decor! And of course there will be food! And thanks to Disney D23 (the official Disney fan club!) and the Orange County Register, we’ve got some sneak peeks of the eats! Note that these eats can be found all over Disneyland Resort — both in Disneyland proper and in Disney California Adventure. So no matter where you are, you’ll be able to find a Incredible snacks! The iconic Pixar Ball will be available, bouncing onto cake pops and caramel apples! 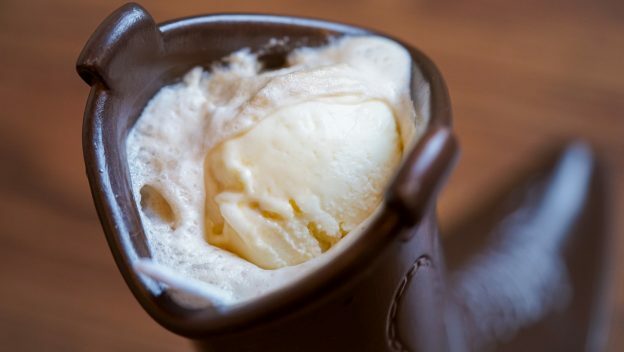 There will also be Boot Beer (root beer served in a souvenir Woody’s boot) at Golden Horseshoe and Jessie’s Berry Jubilee Funnel Cake at Stage Door Cafe! 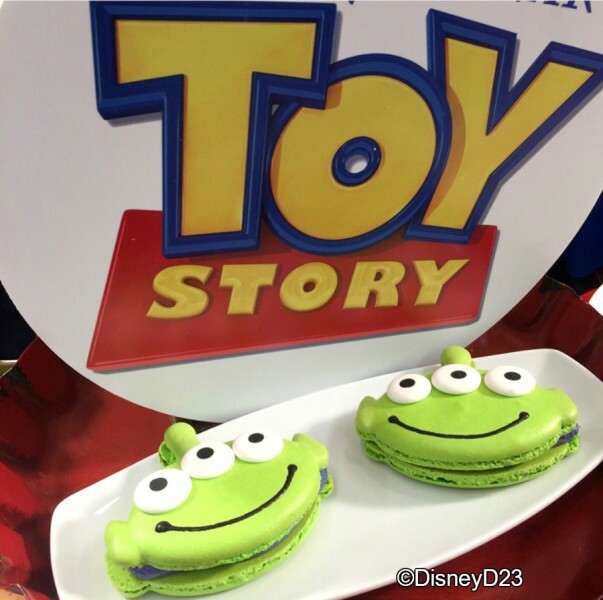 Guests can also take a bite out of everyone’s favorite Pixar aliens with these Alien Macarons — filled with lemon-blackberry filling. Yum! Also they might be too cute to eat, but we’ll persist. The Monsters, Inc. franchise also gets some love with Sully Popcorn Buckets at Disneyland Popcorn Carts and funky Color-Changing Noodles in California Adventure’s Lucky Fortune Cookery! (Randall the chameleon-like villain would dig these!) Carlye Wisel writes that the noodles will be soaked in cabbage before being served and will color change when spritzed with lime or vinaigrette. Have some science with your lunch! If you prefer your Monsters with one eye (hey, these are the jokes, kid! ), there will be Mike Wazowski Sippers available at DCA counter service locations — as well as Mike Wazowski Krispie Treats! And like Baby Groot during the Summer of Heroes in 2017, Mike is also going to available in sourdough bread form at Pacific Wharf Cafe! 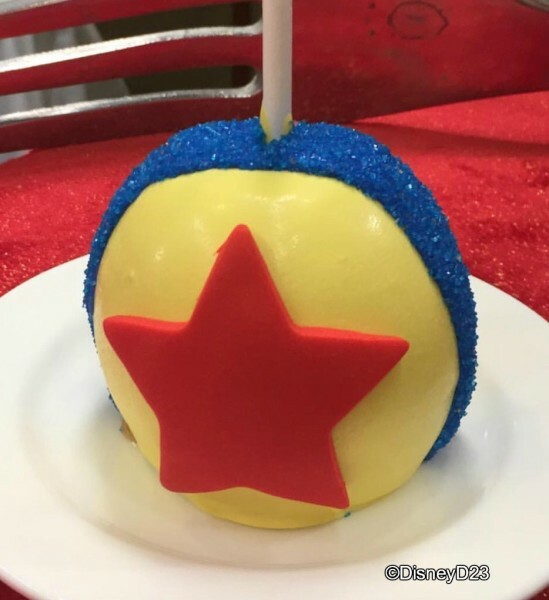 Guests will also find goodies from Finding Nemo and Finding Dory, including Dory Cake Pops and Nemo Caramel Apples! Up! will be celebrated with Fried-ricksen Bologna Sandwiches and the Fredrickson TV Dinner (at Carnation Cafe), an “Up” Merit Badge Eclair (at Jolly Holiday Bakery), and an “Up” Tart — a Nutella Pop Tart!! (at the Capuccino Cart in Disneyland). Ratatouille is getting in on the fun with beignets inspired by the culinary rodent and a three-course Remy menu at Cafe Orleans! (Thanks to Carlye Wisel for bringing us these tidbits!) We’re curious to see the inside of those beignets! 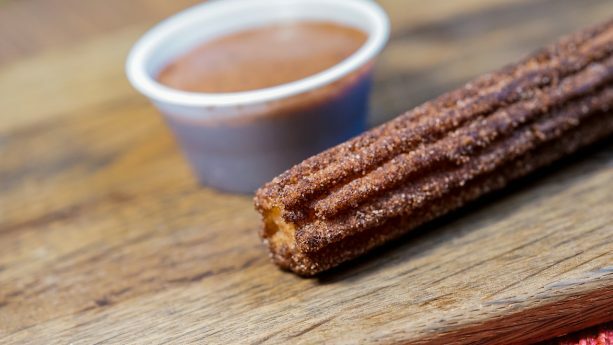 And Pixar’s newest smash hit, Coco, will make sweet music with Coco Churro wbith Chocolate Powder, Vanilla Beans, Salted Cinnamon Sugar, Mexican Chocolate dipping sauce in Frontierland and Souvenir Coco Jaritas (mugs) at Rancho del Zocalo (Disneyland) and Paradise Garden Grill (DCA). Phew! Is it April yet? Because this Fest looks like a total blast! New Pixar Pier Dining Locations Coming Soon! OK, y’all know that Cove Bar is turning into Lamplight Lounge, but there’s a whole lot more to hear about when it comes to Pixar Pier’s restaurants and dining establishments! 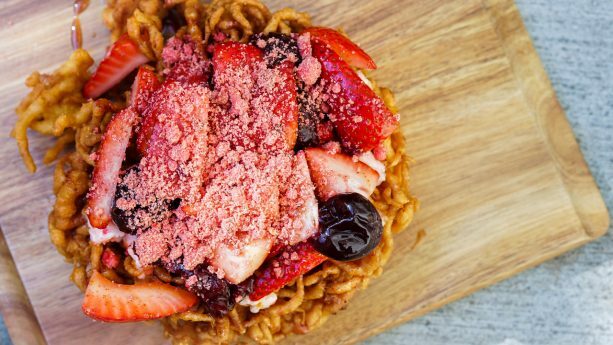 Great news for those who love to combine their thrill rides with serious eats! 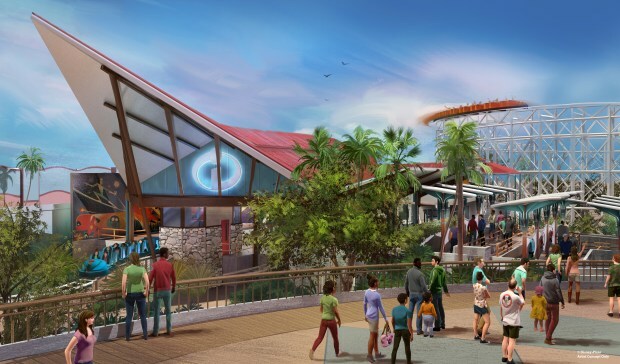 The former California Screamin’ photo kiosk is turning into an Incredicoaster snack spot when Pixar Pier opens on June 23rd! All we know on this one is that there will be a must-have, unique snack offered here…and that Jack-Jack is a fan! Any ideas?? 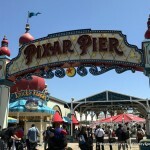 Those fun food kiosks along Paradise Pier? They’re still there, and re-opening with the new land as Pixar-themed food stands! 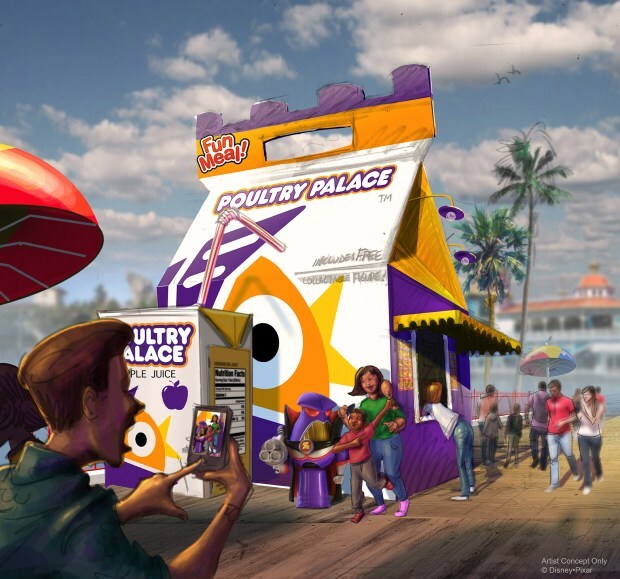 The Turkey Leg kiosk will be themed as Poultry Palace (a la Small Fry)! 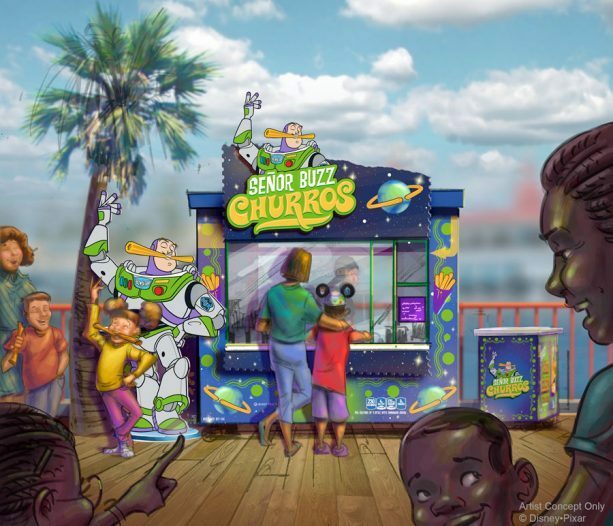 And you’ll buy churros at Senor Buzz Churros (themed to Buzz Lightyear!). 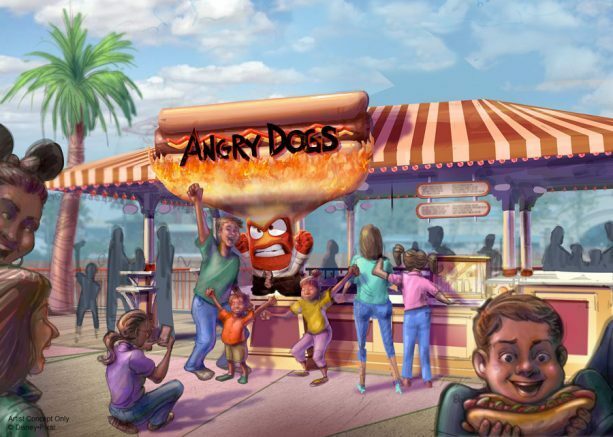 A new Inside Out-themed section of the pier will feature Angry Dogs. 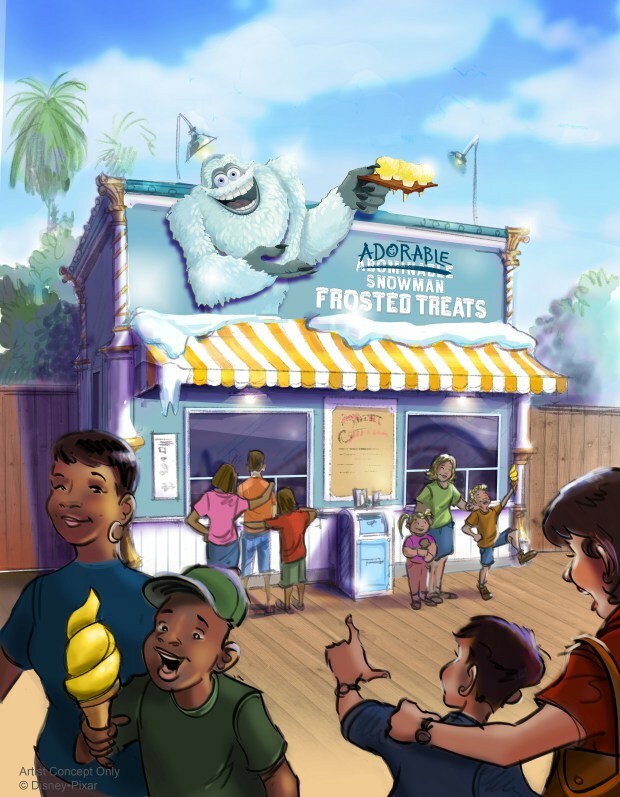 The old Paradise Pier Ice Cream Co. will re-open as Adorable Snowman Frosted Treats and offer icy, sweet treats once again…but this time there will be a signature soft-serve item on the menu, which is basically Lemon Dole Whip! Look for this spot to open earlier than the rest of Pixar Pier — likely around May 1st. UPDATE: Adorable Snowman Frosted Treats is now open! Read our opening day review here! What’s a pier without candy?! Find it on Pixar Pier at Bing Bong’s Sweet Stuff Confectionery, which will serve candy, slushies, and other standard Disney candy shop items along with some exclusive themed offerings. There’s lots more to come on this front! Stay tuned to the DFB Newsletter for details! 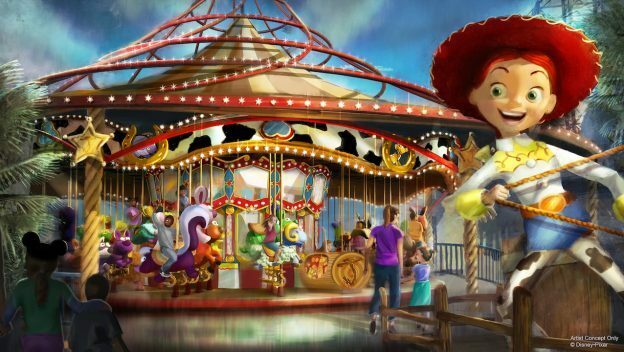 Though it’s not a dining location, we can’t resist sharing the concept art for Jessie’s Critter Carousel, which will open in Pixar Pier in 2019. Jessie’s critter pals from Toy Story 2 (you’ll remember them from “Woody’s Roundup”) will be featured on the carousel. These 56 friends will feature a turtle, snake, buzzard, ram, skunk, raccoon, and more (like two cozy logs that a family of owls calls their home). And remember — even though we’re anticipating Lamplight Lounge soon — Cove Bar will re-open from March 16-May 29 for that final farewell! Note that when Lamplight does open on June 23rd, a section of it will offer reservations! 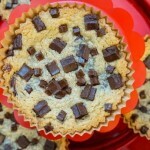 Don’t forget to check out more DISNEYLAND FOOD! 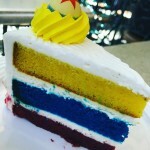 Click here to see our Disneyland and DCA Food Coverage! What are you most excited about trying? Let us know in the comments! 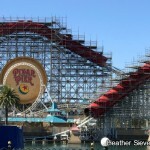 Sources for this coverage include OC Register, Disney Parks Blog, Disney D23 Instagram Account. All concept art photos are copyright Disney. 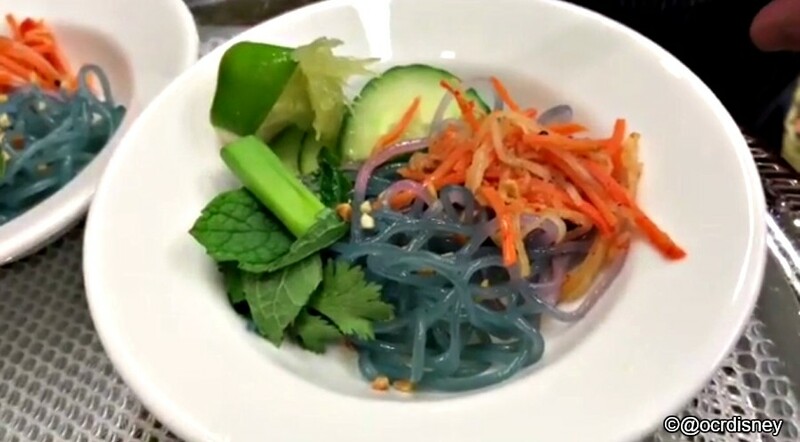 Those color changing noodles look like worms. Worms, Roxanne, worms. I’m not sure about being encouraged to eat yellow snow!